Now in its second year, the New Voices project has given a global platform to interesting writers who were little known outside their own countries. Ten emerging writers from Europe have been selected for special promotion during 2017-18. The names of the Ten New Voices were announced at the 2017 London Book Fair as part of an innovative project, Literary Europe Live (LEuL), led by Literature Across Frontiers (LAF). Based in the Mercator Institute at Aberystwyth University, LEuL brings together a range of literary partners from 15 different countries of the EU. 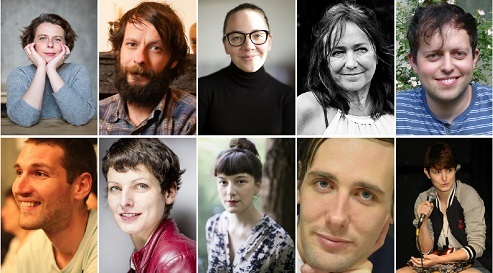 The Ten New Voices for 2017 include novelists, poets, playwrights and translators from Belgium, Bosnia & Herzegovina, France, Iceland, Latvia, Luxembourg, Poland, Romania, Spain and Wales. Now in its second year, the New Voices project has given a global platform to interesting writers who were little known outside their own countries. Following the announcement at the London Book Fair, the ten New Voices 2017 will meet at the Kosmopolis literary festival held at the Barcelona Centre or Contemporary Culture on 22-26 March 2017. During their visit, they will give public readings as part of the festival programme, meet local publishers, agents and literary event organisers, and receive professional advice on how to develop an international literary career. The New Voices from Europe selection is part of the Literary Europe Live project which is co-ordinated by Literature Across Frontiers and co-funded by the Creative Europe Programme of the European Union, with support from Arts Council Wales. Click and read more about New Voices from Europe 2016.